Thank you to Ballard Farmers Market donors! 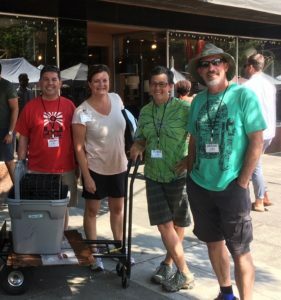 In 2018, the Market Gleaning Team collected over 5,300 pounds of food donated by farmers at the Sunday Ballard Farmers Market, and transported the food to the Ballard Food Bank. Thanks to the generosity of the farmers and the time and energy of the Gleaning Team, all this food was diverted from the compost pile and into the shopping baskets of the Food Bank. Many thanks to our team of volunteers and high school student helpers! If you are interested in helping with the gleaning project on Sundays, 2:45pm – 5:00pm, contact Katie.